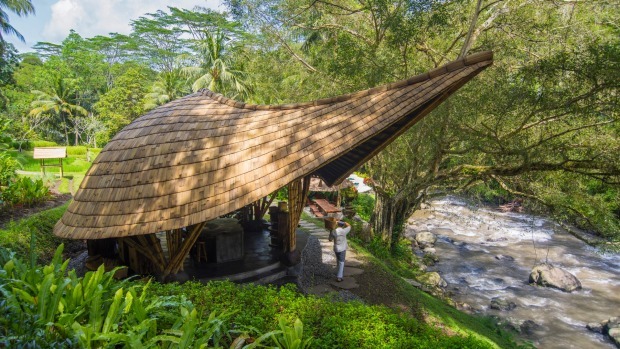 It's mid-morning when we gather on the banks of the rushing Ayung River at Sokasi – quite possibly the most beautiful cooking school I've ever laid eyes on. Named after a woven bamboo box used to store rice, the bamboo structure, with its clever leaf design, morphs from cooking school by day to candlelit chef's dinner table by night. 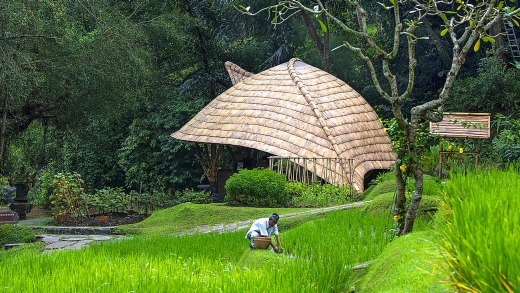 It sits on the edge of Bali's longest river, part of the UNESCO Heritage-listed subak irrigation network. The heart of Sokasi is a high-tech kitchen with a curvaceous stone table lit by woven lamps. Above us, hungry geckos hunt for food in the elaborate woven ceiling. Outside under a towering banyan tree, a table is set for lunch. It's here we'll gather to eat the food we've foraged and prepared with our own hands, with the gurgling river as a backdrop. Family recipes and insights into local herbs are shared as part of the cooking class. The custom-built cooking school opened earlier this year, adding to the Four Seasons Sayan's impressive repertoire of guest experiences. 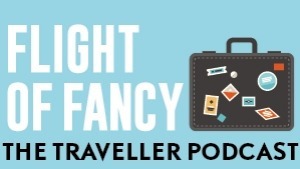 From its dazzling location among Bali's verdant highlands you can try river rafting (which the Obamas did during their stay), do yoga overlooking rice fields, and work up a sweat trekking in the jungle. Set among lush vegetable gardens, abundant with Balinese limes, chilli, eggplant and herbs, the open-air school is designed by Elora Hardy, daughter of renowned jewellery designer John Hardy. It is designed to embrace the surrounding Sayan Valley and the island's diverse produce. All ingredients are locally sourced, right down to the coconut oil made by a staff member's aunty. I've eaten Balinese food countless times since I first visited the island of the gods in the early 1990s – consuming way more nasi goreng and nasi campur than one should in one's lifetime. Frankly all of it pales in comparison to the dishes senior sous chef Wayan Sutariawan (Suta for short) shows us how to prepare. 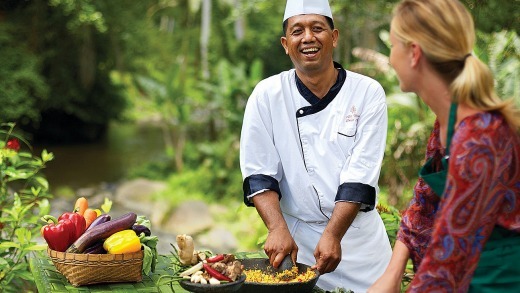 Suta not only shares family recipes and insights into local herbs, spices and aromatics during the half-day class, but teaches about Balinese life, too. First off we're taught that the star of all Balinese dishes is bumbu, a Balinese paste made from ground roots and herbs, which is typically cooked by women. For big ceremonies, cooking becomes the responsibility of the men. Bumbu, also known as base genep, is the foundation of Balinese cuisine and it goes equally well with meat, poultry, seafood and vegetables. The only way to make it, Suta says with a smile, is by firing up your arm muscles – referring to the mortar and pestle we will make good use of later. It was the making of bambu that got Suta thinking about a career as a chef. "I went to live with my aunty at 15 and every day I had to grind the spices for different dishes." Although Suta initially wanted to be a policeman, the daily domestic chore ignited a passion for cooking. After donning aprons, we set to work chopping, slicing and working up a sweat grinding the fresh ingredients in an enormous mortar and pestle. My husband, usually a reluctant cook, and my 10-year-old daughter throw themselves into it with enthusiasm. While nearly all Balinese dishes use bumbu, somehow they manage to taste completely different. Sambal meanwhile, made with chilli, tomato and shrimp paste, gives a little extra heat and spice to Balinese food – the pop, so to speak. Suta explains that the Balinese shop daily, as most have no refrigeration, and they cook just once, in the morning. Ubud is the district market but every village, including the one at Sayan, has a small daily market. Amazingly, food is harvested, sold and consumed daily, with virtually nothing stored. "Produce is harvested today and sold today," Suta explains. Once the bumbu is ground, we saute it in fragrant coconut oil before it is added to beef to make sizzling satay sticks and lathered over snapper, which we wrap in banana leaves. It is also used for an aromatic vegetable curry. The sambal, which has a definite kick to it, is dolloped on top of fresh grilled tuna and tastes incredible. My daughter, typically not an adventurous eater, is spotted sneaking a spoonful of sambal (it is seriously that good). 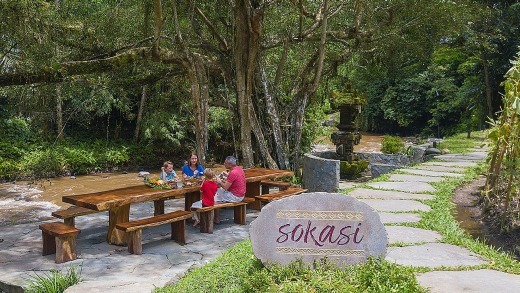 When all the dishes are prepared, we sit down at a long table, steps from the river, with views of green rice terraces beyond. We listen to Suta's stories, laugh and feast on the dishes family-style, washed down with fresh coconut juice. Sokasi proves yet again there really is no better way to learn about a country's culture than through its food. Sheriden Rhodes was a guest of Four Seasons Sayan.